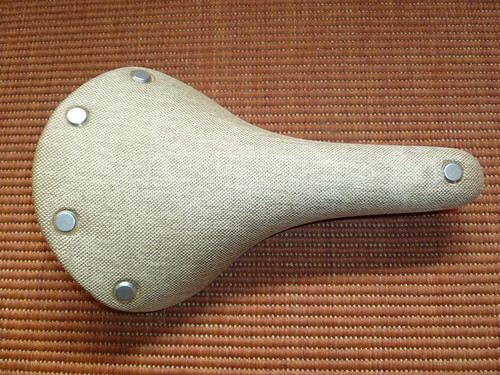 Brooks Cambium, I'm a saddle tester! A few months ago I received a newsletter from Brooks announcing that they were to introduce a new range of non leather saddles. They also announced that they were looking for 100 cyclists to volunteer to test out the new saddles before they went on general sale. I've always been a bit of a sucker for free offers and what's more I've always thought that testing cycling or outdoor products could be my dream job so I filled in the questionnaire. I have to admit that by the time I'd worked my way through it I was beginning to lose interest. It had also occurred to me that I had at last got a saddle that I was completely comfortable on and that volunteering to change it was not really a good idea. The last question was why should they pick me as a tester. I dashed off a short literary masterpiece 'because I ride a lot of miles', hit submit and promptly forgot all about it. It came as rather a surprise when I received an email telling me that I was one of the chosen few. Brooks were being fairly coy about these saddles – there were no clear pictures of them so it was quite exciting to receive a big box and see what they actually looked like. I was certainly taken with its looks. It combines traditional elegance with a modern look – I presume this is just the effect Brooks wants. Made from natural rubber vulcanised in Italy and covered with organic cotton its designed to appeal to those who want the perceived cachet of a Brooks saddle without needing to break it in, take care of it with proofide or protect it from the rain. Personally I enjoy looking after my B17. Its definitely lighter than my B17 – 400g on my kitchen scales as against 500 for the B17. I would have thought there was a greater difference than that, it somehow looks a lighter saddle but that may just be down to the pale colour (there is also a black version). 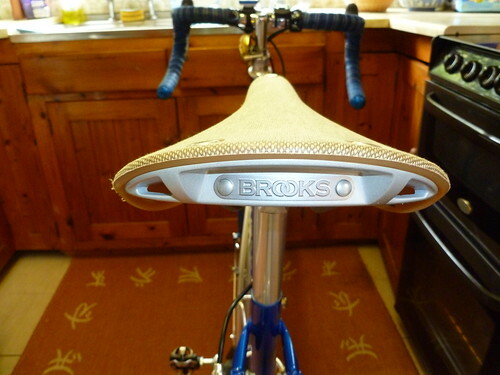 Brooks have invested heavily in the Cambium, there will eventually be ten models available. I don't know what the price will be but one of the first questions asked when receiving it was how much you would be prepared to pay for it. Options varied from under £90 to over £150 so I think I can safely say that it won't come cheap! Of course saddles are for sitting on not for looking at so how does it ride? Its narrower than a B17 but it was comfortable on a couple of 30 mile rides. There is a bit of bounce in the rubber which makes for noticeably less jarring over rough road surfaces. We seemed to be getting on well together so I rode it for a 66 mile circuit of the island. It was fine at the time but I'm afraid when I got back on the bike the next day I was quite sore and very happy to get off the bike after a 33 mile ride. It is quite different in shape than my B17 and I think I need to drop the height down a bit to cure the soreness. I was intending to keep it on for my upcoming French trip but I'm afraid that after my experiences at the weekend I've put my B17 back on. Its early days yet. I'm very taken with its looks and I shall definitely continue riding it when I get back but I am beginning to wonder if being a bike component tester would be such a dream job after all! Posted by Hilary on June 4th, 2013. Well done Hilary. Something to put on your CV – 100-150 testers worldwide is not very many, although one wonders why they are testing the saddles only a short time before release on 17th June, and after all the investment, not before. It looks as if it might to appeal to Tweed Run types more than high mileage cylists. I can imagine the textured cotton becoming grubby quite quickly and wearing through your bib shorts/tights etc. The smooth leather saddles don't do that, plus they become more attractive with age, and I agree with you about the pleasure of looking after the leather and how it adapts to one's anatomy. I've got four B17s and I can't imagine changing. Have a nice time in France. I hope the weather's nice. Fascinating. I guess there's an upside, a downside, and a backside to being a bike component tester :). My guess is that the rubber will not mould itself to one's personal form as well as leather. Let us know how the tests progress. If they want sensible feedback, I am amazed that (I assume) they didn't look at or ask the testers what size and style of saddle they currently rode.. most cyclists can give more negative feedback about saddles that (for a whole host of different reasons) they didn't get on with.. which may not reflect the suitability of a given saddle for its optimally-suited rider! If you want to get the best idea of how good a new saddle of yours is, at least try your best to match it to the rider before sending them off to mould their bums to it. A fitting session at a nominated dealer in the area would suggest itself as a reasonably affordable solution.. Agreed with Patrick too that one month before launch is ridiculously late to be doing field trials – if you want a decent test and a reply! What useful data can they garner at that notice that would actually be useful in either refining or remarketing the product? But then, I'm not a product designer, so what do I know.. Brooks do what they do best better than I think I could. Let's wish them luck with this venture. Hi Frank. Sorry to take so long to reply, I've been away. As both Dan and Patrick have commented it is too late for Brooks to gain much useful information from their testers, I suspect it is really more of a marketing exercise. Actually Brooks marketing is superb – in a few years they have completely changed the perception of their saddles from an old fashioned, old man's product to a trendy must-have! I've tried the saddle at 'a' bike show, and love it as a 'comfort racer'. If you have any interest in letting your sample go, please let me know!